A busy year is in the works for OCCC Reads, said Reference Librarian Rachel Butler. This year’s program will be centered around “Water Matters: Why We Need to Act Now to Save Our Most Critical Resource,” by Tara Lohan. Butler said many books used for the program in the past have been fiction. This year a non-fiction book is being used about a currently important topic, to stimulate the minds of students and help them develop opinions about current events. “Up to this point, we’ve done all different kinds of fiction, and we wanted to do something that wasn’t fiction, and [would] maybe be of interest to a wider bunch of people around campus,” she said. “‘Water Matters’ appealed to us because it talks about water, but approaching it from all different directions. That just seemed more interesting than just a single minded focus on some aspect of it, just because it’s a huge topic. Butler said many professors and administrators were approached about the idea of using “Water Matters,” and the book was chosen after an overwhelming approval by many who wanted to incorporate it. Butler said more activity than ever before is planned for OCCC Reads this year. Many events will take place on campus relating to water throughout the year, she said. “We have one proposed talk that may turn into a panel, about water and health,” she said. “That could be public health, or just within your own system internally. “We have one professor who wants to talk about where water comes from a physical standpoint, and the amazing properties of it. Butler suggested that while not set in stone, she hopes to see the program finish the year strong, with a big event on Earth Day in April. Butler said most events are planned but not yet announced, and there is still room to plan more events, and anyone with an idea could help. She said with this she hopes to have this year’s OCCC Reads program be more thought provoking than ever before. “We don’t have to have all the ideas,” she said. Any professor can bring their passion and their knowledge to it too, and do something to it that we haven’t even thought of. It is fun and exciting, especially with this topic. The different approaches of different people, and their passion that comes out. The program, which is in its seventh year, chooses a book to have seminars about and include in many class curriculums during the following school year, Butler said. “OCCC Reads was sort of modeled after the National Endowment for the Arts Big Read program,” she said. “They pick books, and libraries and groups all around the U.S. have what’s called a community read. That’s the idea that we pursued. 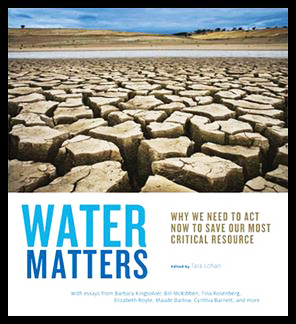 For more information about OCCC Reads or this year’s book, “Water Matters: Why We Need to Act Now to Save Our Most Critical Resource,” visit www.occc.edu/library/occcreads.html, or contact Butler at 405-682-1611, ext. 7643, or Tricia Sweany at 405-682-1611, ext. 7416. “Water Matters: Why We Need to Act Now to Save Our Most Critical Resource” can currently be checked out at the Keith Leftwich Memorial Library.